Discussion What the meaning of this WARN? What the meaning of this WARN? Happy Thanksgiving to GATK staff !!! i know you guys are on vacation , so i am no hurry to get answer.but i still want to ask it in advance. what the meaning of it ? it seems that this warn is not something severe , am i right? 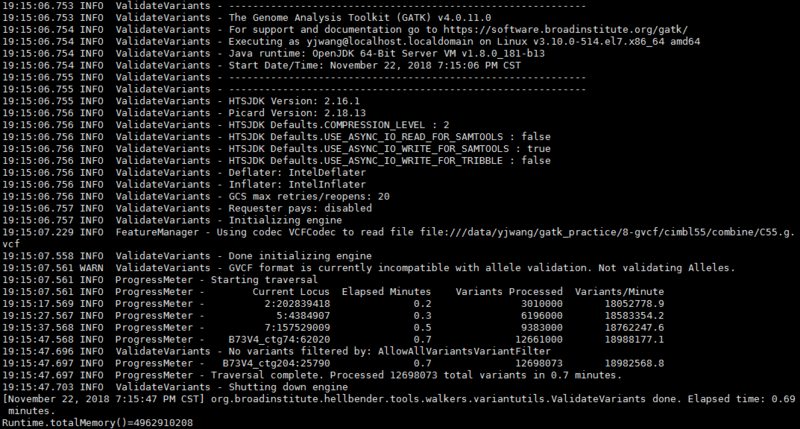 Besides , i run ValitateVariants to validate my GVCF file. i think that mean that my gvcf file is totally fine. i hope you guys can give me some help when you come back after vacation. Hi @Zea1nfO, thanks; I hope you had a good Thanksgiving too! You can ignore that warning; MLEAC is one of several annotations that can't be merged and actually gets recalculated by GenotypeGVCFs. There is some work planned to get rid of warnings like this that aren't informative. The validation looks fine, assuming you ran it with the GVCF mode turned on. i sincerely hope our forum get better and better, even some problem come up these days.